Rattlesnake Creek enters the Clark Fork River across from this point, completing the journey from its headwaters high in the Rattlesnake National Wilderness Area. Missoula’s first building was a two-room log cabin constructed by William T. Hamilton in 1858 near the mouth of the creek. Hamilton built the cabin to serve as both his home and as a trading post. The building also housed the town’s post office for several years. Hamilton was elected county sheriff in 1861. When the Stevens Bridge (located near St. Patrick Hospital) washed out in 1869, William Burmester operated a ferry near the mouth of Rattlesnake Creek as the primary means of crossing the Clark Fork within the present town’s limits. It continued as such until the Higgins Avenue Bridge was constructed in 1873.
in honor of its benefactor. Rattlesnake Creek provided water power to run Missoula’s first lumber and flour mill west of the creek. The clear waters of Rattlesnake Creek served as Missoula’s drinking water supply until 1983. Location. 46° 51.993′ N, 113° 59.184′ W. Marker is in Missoula, Montana, in Missoula County. Marker can be reached from Maurice Avenue north of South 5th Street East when traveling north. Touch for map. 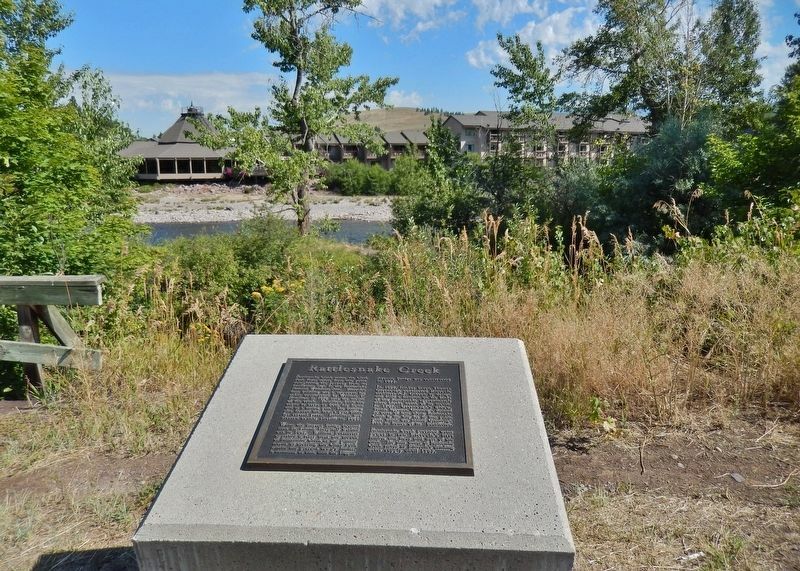 Marker is located along the Kim Williams Trail, in Madison Park, overlooking the Clark Fork River, just north of the parking lot at this intersection. Marker is at or near this postal address: 1534 Maurice Avenue, Missoula MT 59802, United States of America. Touch for directions. Other nearby markers. At least 8 other markers are within walking distance of this marker. Glacial Lake Missoula (about 600 feet away, measured in a direct line); Draper Residence (approx. 0.3 miles away); Federal Building & United States Post Office (approx. 0.4 miles away); Free Speech Corner (approx. half a mile away); Danger Ahead! (approx. half a mile away); A Shortcut (approx. half a mile away); Name That River (approx. half a mile away); Northwest Passage (approx. half a mile away). Touch for a list and map of all markers in Missoula. More about this marker. Marker is an embossed metal tablet, mounted horizontally on a waist-high stone and masonry pedestal. More. 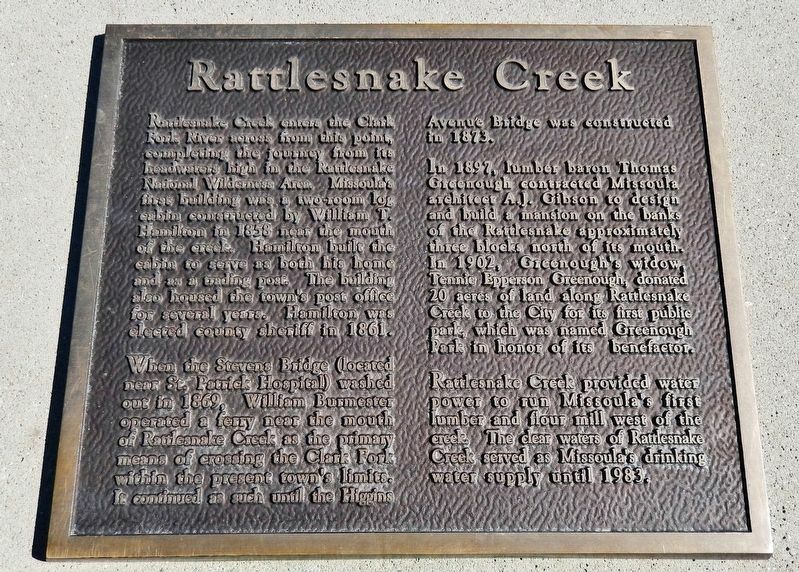 Search the internet for Rattlesnake Creek. Credits. This page was last revised on February 26, 2019. This page originally submitted on February 24, 2019, by Cosmos Mariner of Cape Canaveral, Florida. This page has been viewed 30 times since then. Photos: 1. submitted on February 24, 2019, by Cosmos Mariner of Cape Canaveral, Florida. 2. submitted on February 25, 2019, by Cosmos Mariner of Cape Canaveral, Florida. • Bill Pfingsten was the editor who published this page.